Mary Coleman owner of the Farr 40 Astra that I race in San Francisco with her partner Jim Forrest bought a penthouse condo on the beach in Puerto Vallerta. She kindly invited a few of us to spend Thanksgiving with her in the sun. I bought my ticket long before getting my 3 month job in New Zealand so it was a long haul to say the least to get there. The catering truck ran into the Quantus plane in AKL the pilot thought it was fixed so after sitting at the gate for an hour and half he put us on the plane. We sat on the plane for 2 1/2 hours on the runway leaving AKL at 11:50 at night. There was a medical emergency in flight and we were met by an ambulance and fire men. Then when we landed in LAX the tow bar broke off the plane so they had to repair that before they could get us to a gate. Missed my connection to SFO so they wanted me to sit in LAX airport for 8 hours waiting for another flight – not my idea of a good time. Long and short of it was I got my flight changed to 8amÂ the next day to Mexico from LAX so I didn’t have to go back to SFO and arrive at 11pm to leave early the next morning. Next challenge was to find someone to stay with in LA over Thanksgiving week when everyone is going away. So I started dialing for dollars as it were. Found a friend willing to give me a bed then had to figure out how to get to the bed! Again all the rental cars were booked with the big rental companies so I ended up paying a lot of money for a local company which gave me a dirty car with 140,000 miles on it. A far cry from the one I got last weekend in NZ which had 7km on the dial for less money :-). So off I drove down to Newport Beach. 5am wake up to make my early flight down to Mexico. This was my first time to Mexico (I don’t count Tijauna) but nuevo Vallerta is really just condo complex after condo complex on the shore of Banderas bay so I was in effect staying in the US. Mary, Jim, Magda, George, Bob and Terri had been there for the week so by the time I turned up on Wednesday they were already in local relax mode. Gus and Delphine came in the same afternoon as myself. Mary had as usual planned everything beautifully and provided copious amounts of delicious food. Thanksgiving morning we went for a ride on a steam launch through the canals and saw all the wildlife including croccodiles, pelicans, dolphins and many iguanas. We had a typical thanksgiving dinner with a flair at a restuarant in the cobbled streets 20 minutes from the house. It was a warm night and there was the usual mexican band walking amoungst the tables. On Friday we rented a boat for the day and went to a small fishing village along the coast there wasn’t much sailing until the afternoon when a little wind came in. The boat was a 30 year old beautifully restored wooden yawl built to take a beating. The crew was attentive and Gus, Delphine and I had a great time swimming from the shore back to the boat – a touch cold at first but you got use to it. We had dinner at a French place on the beach it was good food but we weren’t sure it was worth the two hour wait for our entrees! Saturday was a lie on the beach and read a book day. In the evening we all crammed into the Jeep with two of us in the boot and went to PVYC for drinks. Then on to PV old town to Fajitas Republic a really good mexican restuarant on cobbled streets of old Vallerta. A stroll along the boardwalk was needed to walk off the food. There were fireworks from a pirate ship, sculptures, jugglers, all amongst the typical warm climate atmosphere where everything overflows onto the pavements at night. Delphine had cotton candy and then it was time to go to Mary and Jim’s favorite bar. I liked the bar because it played country and western! The also had a donkey – a real live one – for patrons to ride around the bar – we have some great pictures of Gus and Delphine on the poor donkey. Lots of margaritas, shots of tequila and in my case shirley temples later we made our way home to comfortable beds. Sunday it was time to go home to San Francisco. My flight luckly left and arrived on time so I was able to get to Daniel couch in Marin in time for 8 hours of sleep. Monday I was able to spend a great day hanging out with my nephew who has learnt to walk and is very proud of himself. He wants to do it himself now and not be held back in anyway. Then it was off to the airport again for another 13 hour airplane trip back to Auckland, NZ. Carrying Inflatable PFD’s with you on Commercial Aircraft can be a distressing event, unless you plan on it in advance. The issue is, that the charged cartridge on the inflatable is a Hazardous Material as defined by the FAA Regulation (49CFR175). There is an Exception 25 in the Regulation that allows the carriage of charged inflatable PFD’s (one PFD per passenger and one spare cartridge), but leaves the option to the Individual Air Carriers whether or not to accept them on their flights. These same rules apply whether you take your inflatable as a carry-on or check it through. Life becomes more involved for us sailors since the U.S. Air Carriers do not follow the U.S. FAA Regulations in this area, since most deal with international flights where the Federal Laws have no jurisdiction. Therefore, the U.S. Air Carriers subscribe to a higher level of regulations called the International Air Transportation Association (IATA). The IATA is more restrictive than the FAA, but in this case, they mirror the FAA. The IATA does not call the cartridges “hazardous materials” as the FAA does, the IATA calls it a “Dangerous Goods.” For more ideas on boating items you may be carrying that may be considered a Dangerous Good look at this IATA list. When ordering your tickets with the airline, speak directly to the airline, not your ticket agent and ask them, if it is acceptable to carry your Inflatable PFD that contains a charged CO2 cylinder that meets FAA Regulation 49CFR175.10, Exception 25 and the IATA Dangerous Goods Regulation Table 2.3.A. If the ticket agent calls their Hazardous Materials department (some air carriers call this their Dangerous Goods Inspectors), get the approving authorities name and phone number as well as the name and phone number of the approving agent and have that information ready with you when you check in. Believe it or not, the final decision will be made at the gate, with the final decision made by the gate attendant. In the safe environment of air carriers, everyone appreciates it when they error on the side of caution. The NZ weather has been good to us recently but we still do get days of drizzle and mist-you know its a grotty day when you can’t see the Auckland Harbour Bridge. This week-end, Ashley and I went to a place called the Coromandel Peninsular. It is a lovely spot and only 2 hours from Auckland. We did a walk up to a place called The Pinnacles, which is basically a rocky outcrop that used to be magma from a volcano. It is meant to take 3 hours to get to the top but we managed it in about 2.5 which was rather satisfying! The surrounding area is where they used to do alot of kauri log mining. You have to climb up steep stone steps on the walk which they used to send the pack horses up- I don’t know how the horses got up- some of it was very steep and the paths even went across rocky streams! The loggers set up a dam system which they used to send the logs down the hill. One of the streams was renamed Calamity Creek as it was very steep waterfall and all the logs shattered at the bottom…. They used the dam system to send up to 28,000 logs downstream- huge amounts!! We spent the night in the Dept of Conservation hut with 40 others! The hut actually sleeps 80 and it was full- there were lots of family groups so it had a nice atmosphere. It reminded me of the walks my family used to do in HK. We walked down the hill, along the Billy Goat trail. We were very lucky as we did actually see a billy goat! 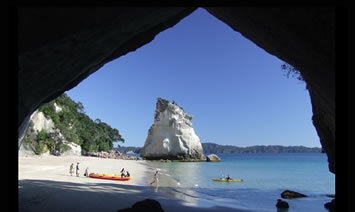 After the walk, we drove to Hot Water Beach and Hahei Beach where we took a sea kayaking trip to see Cathedral Cove. It was great fun on the kayak. Ash is an experienced kayaker but I am a novice- apparently I need to work on my technique which is not as efficient as it could be! The kayak leader heard of Ash’s experience and decided to liven up our kayaking trip by launching us from the beach straight into a massive wave- we did not turn over but it was a very comical/hair raising experience taking a wave full frontal! I was in the front, as I did not trust myself to steer the kayak, so got the brunt of it!! Tonight, to save costs I am staying the night on the boat with Ash. The boat is 90 foot long and amazing- it has all the mod cons including air con, fridges, freezers, washing machine, dryer, computers, jacuzzi up top and some lovely guest cabins. The staff cabins are pretty good too. I am now seriously considering doing some sailing courses and trying to get a job as a stewardess on a boat. This last weekend Annabelle and I drove down to Whakatane via the south shore of the Hauraki Gulf. It was a beautiful drive and we stopped at a village hall to buy some homemade cakes for lunch! Â We got to Whakatane in the early afternoon on saturday and checked into the backpackers and then spent the afternoon walking around town. We saw a Maori canoe, a cave that is special to the Moari people and checked out the enterance which reminds me of Morro Bay – there is a standing wave at the harbour enterance and lots of rocks. The harbour is long and narrow and on a rock at the enterance there is a statue of a maori woman. Â On Sunday morning we got on Peejay VÂ a 73 foot custom built powerboat for a ride out the White Island which is 50km offshore. The trip was uneventful except for one of the passengers passing out right next to me – the crew reacted very professionally. 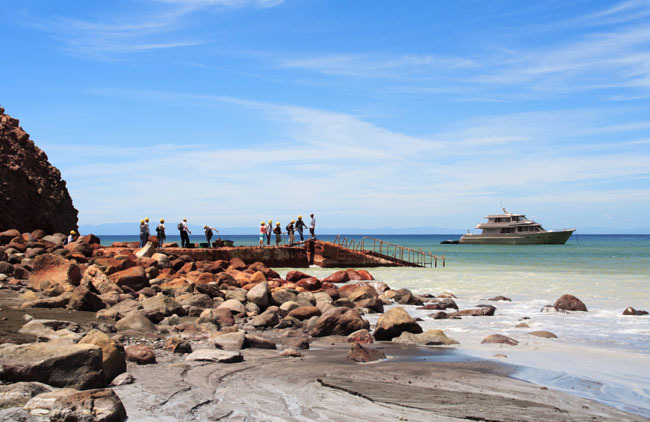 The owners of White Island Tours have worked hard to create a great experience they have it down pat. You are given a gas mask, hard hat and are divided into groups and get into the 15 foot dinghy that ferries you to the pier on White Island. White Island is one of the most fascinating and accessible volcanoes on earth, carrying with it an A grade level of scientific importance.Â As New Zealandâ€™s only live marine volcano, scientists and volcanologists worldwide are attracted by its unique features. 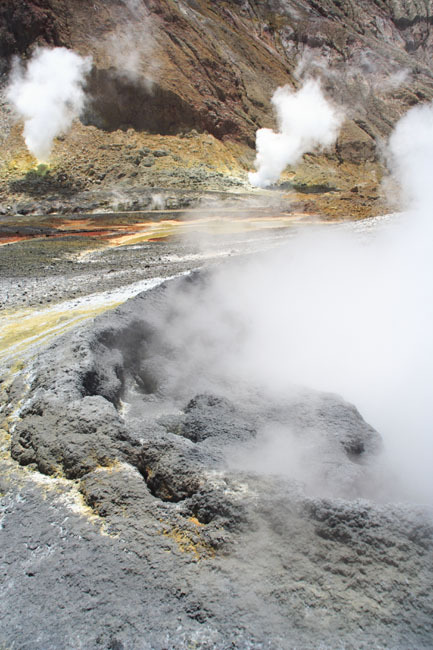 The volcano is estimated to be between 100,000 and 200,000 years old.Â However, the small portion of the island that is visible above sea level has been in its present form for an estimatedÂ 16,000 yearsÂ – evidence of a continually changing landscape. 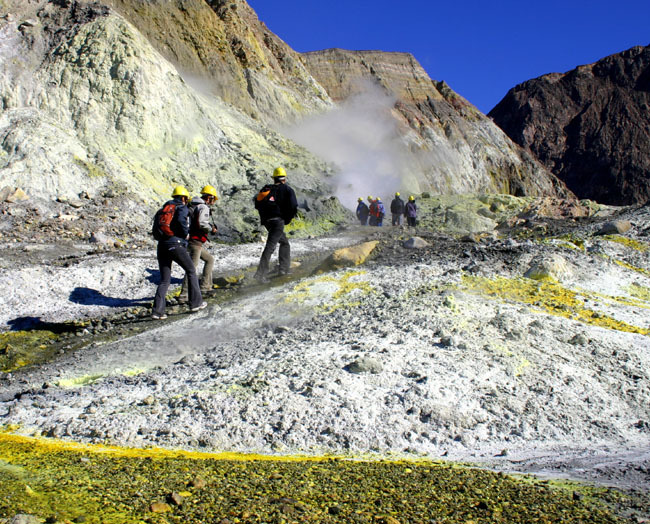 Â Walking on White Island is like walking on the moon.Â Virtually no vegetation survives the harsh acidic environment inside the crater walls.Â Instead, lush beds of yellow and white sulphur crystals grow amongst hissing, steaming, bubbling fumaroles. Â Giant mounds, remnants of the 1914 Great Landslide, dwarf visitors as they wind their way up to the Main Crater.Â Venturing to the edge, they are greeted by an amazing sight – an immense crater, with towering walls shielding its spectacular lake and punctuated by steamy vents from which the power of the inner earth constantly belches forth. Â Neighbouring Donald Duck and Noisy Nellie Craters each have their own stories to tell and a view from on high.Â Down below, bright yellow chimneys of delicate sulphur crystals enhance the alien landscape and lure the visitor for a closer look. Â In contrast to these natural features, stand the ruins of an old factory, the only human testament to the numerous failed sulphur mining attempts of days gone by, and now slowly being reclaimed by Mother Nature. Â White Island currently sits on an alert level rating of 1, meaning she is always active, constantly steaming.Â Misty, roaring, ashing, rumbling . Â Annabelle and I used our gas masks quite a lot the sulphur really does irritate your throat. The weekend was an exciting experience. Next time I think I will do a diving trip out hereÂ – apparently it is amazing as there are pockets of hot air escaping from underwater fumerals. Â We got back really late to Auckland on Sunday night ready for work on Monday morning. Â Hope you had a good weekend where ever you were.